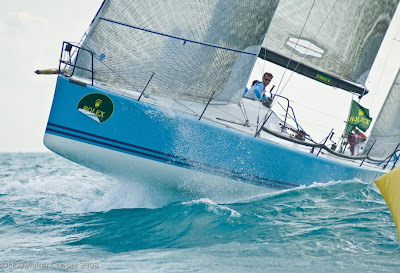 Doug Douglass’s Goombay Smash has won the 2008 Rolex Farr 40 North American Championship. This was Douglass’ regatta to lose as he led former world Champions Nerone and Barking Mad by four and five points respectively going into the final day pf racing. He finished today’s races with scores of 2, 3 & 2 to clinch the championship and be named boat of the day for the second day in a row. 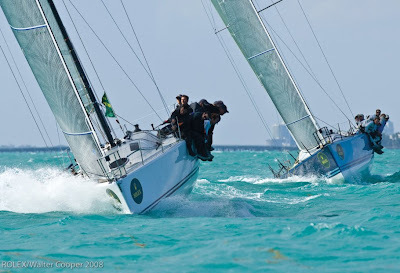 Douglass also won the Rolex Farr 40 Pre-Worlds in Miami Beach in April, but this was his first win with new tactician Morgan Larson, who was a last minute substitute for the first day of the 2008 Rolex Farr 40 World Championship for winner Vincenzo Onorato. Only eight boats turned out for the regatta. 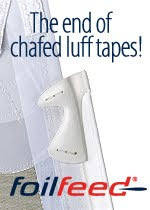 See final results.